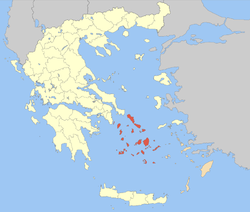 The Cyclades (/ˈsɪklədiːz/; Greek: Κυκλάδες [kikˈlaðes]) are an island group in the Aegean Sea, southeast of mainland Greece and a former administrative prefecture of Greece. They are one of the island groups which constitute the Aegean archipelago. 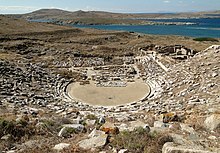 The name refers to the islands around (κυκλάς) the sacred island of Delos. The largest island of the Cyclades is Naxos. The first archaeological excavations of the 1880s were followed by systematic work by the British School at Athens and by Christos Tsountas, who investigated burial sites on several islands in 1898–1899 and coined the term "Cycladic civilization". Interest lagged, then picked up in the mid-20th century, as collectors competed for the modern-looking figures that seemed so similar to sculpture by Jean Arp or Constantin Brâncuși. Sites were looted and a brisk trade in forgeries arose. The context for many of these Cycladic figurines has been mostly destroyed and their meaning may never be completely understood. Another intriguing and mysterious object is that of the Cycladic frying pans. More accurate archaeology has revealed the broad outlines of a farming and seafaring culture that had immigrated from Anatolia c. 5000 BCE. Early Cycladic culture evolved in three phases, between c. 3300 – 2000 BCE, when it was increasingly swamped in the rising influence of Minoan Crete. The culture of mainland Greece contemporary with Cycladic culture is known as the Helladic period. The Cyclades comprise about 220 islands, the major ones being Amorgos, Anafi, Andros, Antiparos, Delos, Ios, Kea, Kimolos, Kythnos, Milos, Mykonos, Naxos, Paros, Folegandros, Serifos, Sifnos, Sikinos, Syros, Tinos, and Thira or Santoríni. 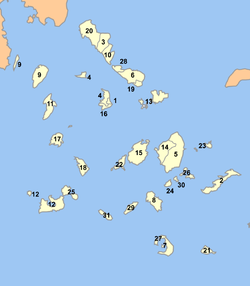 There are also many minor islands including Donousa, Eschati, Gyaros, Irakleia, Koufonisia, Makronisos, Rineia, and Schoinousa. The name "Cyclades" refers to the islands forming a circle ("circular islands") around the sacred island of Delos. Most of the smaller islands are uninhabited.